The backbone, the foundation, the rhythm that keeps all others on beat—the drummer is to the band what the sole is to the feet. So often they’re left in the background. And in the age of beats programmed and looped, some get pushed further. But the artistry exemplified by true percussionists can’t be so easily contained. It finds a way to fly out and hit the stage, on its own when it has to or with the aid of fellow musicians who know how to pull it forward. Watch the drums glow. Photo courtesy of Hyde Bellagio. 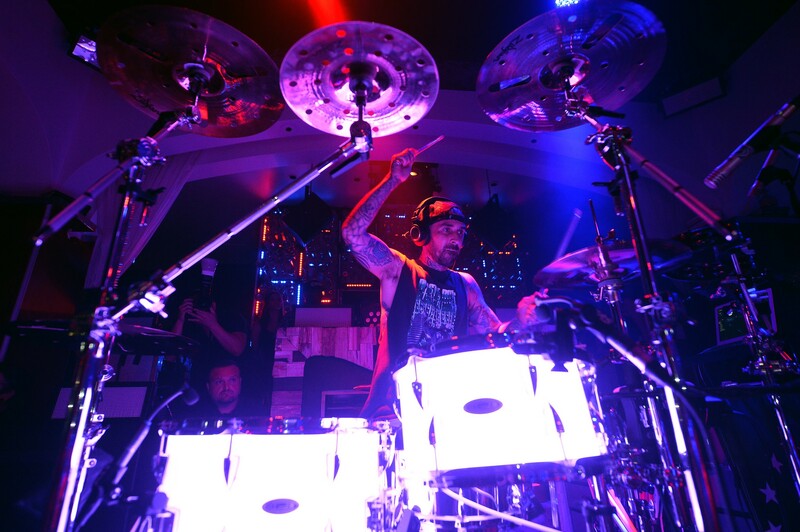 Travis Barker first entered the zeitgeist as the drummer for Blink 182. If you don’t already know that then you’re either too young to realize how influential the pop punkers were, or you just have terrible taste in music. Sorry, but there it is. Driven by Barker’s rolling and splashing beats, Blink 182 became stars of Gen Y’s uncertainty and ennui. But that was way back in the early 2000s. Since then, Barker has branched out to prove he’s more than the backing for a couple of diverse singers. From clothing lines to TV, Barker became an icon in his own right—deservedly so. 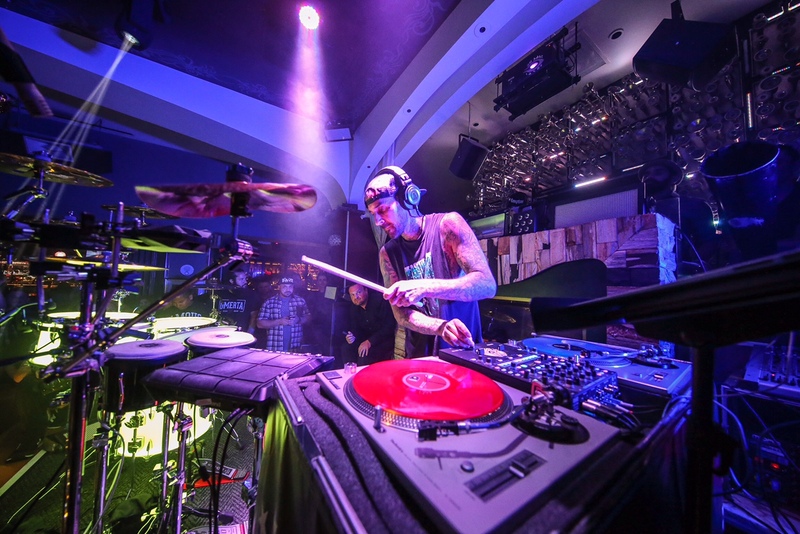 But what’s brought him back to Vegas throughout the years, and now for his “Give the Drummer Some” residency at Hyde Bellagio, is his love of the DJ scene. During a time on convalescence after breaking his arm on tour, Barker taught himself how to scratch and spin on turntables. He hooked up with other DJs like AM and brought the defiant style that’s so prevalent in punk music to the clubs. Many might be surprised to learn that one can in fact drum and spin at the same time—if they’re talented enough. It takes a special person to be so attuned to the songs that they can remember the transitions and downbeats that make each unique while maintaining the improvisation and connection to the audience that turns DJs into superstars. For his current sets, Barker has memorized around 70 songs, each with individual elements he lays out on his carnival kit. But, as impressive as that is, it in no way means the show is rigid. Barker is an incredible performer and truly believes that the audience is the most important aspect of any show. 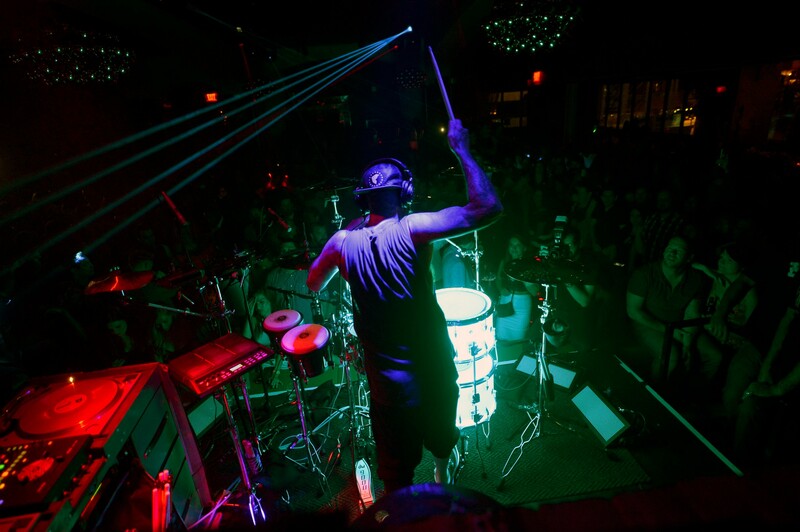 Organized on stage with his turntables and his drums that light up with the strikes, he’s able to bring the power and presence of percussion to the front of the stage and take the room past the sounds it’s known. The experience is something that may seem new to some, may seem delightfully classic to anyone who’s seen Barker perform before, but will undoubtedly be impressive to all. Sound and sights. Photo courtesy of Hyde Bellagio. 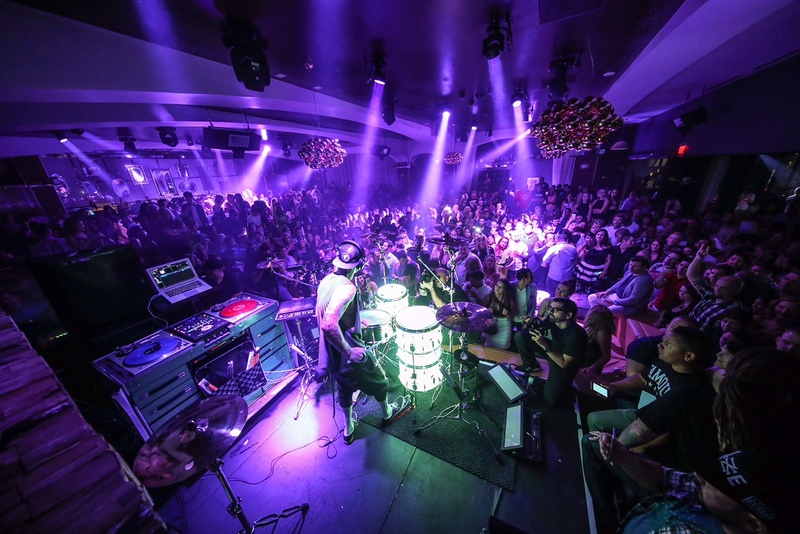 Hyde Bellagio is the ideal venue for this residency. And it says a lot about the club that they waited until the perfect fit to host their first official residency. With the Bellagio Fountains just outside and the night air flowing in, feeling connected and overcome is easy. And each time Barker shows you a new aspect of his talent, both technically spectacular and creatively ecstatic, you’re reminded why so much music and so many performances we rely on for expression are deeply dependent on the drummer. And check out other fantastic Las Vegas nightclubs on our nightclubs page. Showing how it’s done. Photo courtesy of Hyde Bellagio.